Speed skier Steve McKinney attracted a thousand people to a party for him — 28 years after he died. The proximate reason was him gaining entrance into the U.S. Ski and Snowboard Hall of Fame, but this wasn’t the highfalutin’ induction ceremony. This was before that, on a Thursday night last month, really a grand reunion in Squaw Valley of neighbors and top skiers from back in the day. Yes, it’s a ski town thing, where CEOs and plumbers grip each other behind the neck or with bear hugs and back slaps in greeting after too long since they last met, in some cases before they’d gone gray. Young, fit men in flannel and straight-bill ball caps, a unique rural-urban fashion pairing, stand stone-faced until they bump into kindred souls, then light up. Unsurprisingly, I suppose, my favorites are the middle-aged women shaped by the slopes and the weather, eyes and hair a bit wilder than, say, their suburban peers, and more tanned, more deeply lined, more ready smiles. Looking happier for the mountain life and still skiing. Some absolutely, stunningly beautiful to me. Something in the eyes and something athletic, maybe feral, in how they move, with grace and suggestion of wire strength. They’re no longer the majority in the crowd. Most of the women this evening are softer for their own skiing lives well in the rearview mirror or never having been bitten by this particular bug like their husbands or boyfriends. One of the challenges for the sport is women are far more likely to stop at an earlier age. The bother of it. The kids. In my family’s case, it was a chance for a long bath and some peace while dad took the little hellions on the mountain. The break from the kids and the cacophony became more appealing than sliding around in the cold. McKinney died before these reunions, before ski companies metastasized into luxury recreational empires, before long-time Squaw Valley locals sensed a golden age dying under them as they recognized fewer and fewer neighbors. Times change, of course. Crappy little cabins give way to McMansions and then whatever comes next. The lifestyle gets more expensive, way more expensive. The runs get more crowded even with bigger, faster lifts. Skiing and boarding are easier with their constantly evolving equipment, though they don’t seem safer. Many in this crowd can remember the blissful days before snowboards showed up. Yes, most of this nostalgia is misplaced, I know. I like whisking right up on today’s chairs and gondolas, more groomed runs, shaped boards, less chance of tearing off a knee, ropes fencing off hazards I once would have been expected to see for myself. “The experience” reminds me of all the things I detest about golf. Yes, golf. The clothes, the cut grass, the friggin’ whispering, everything in its place, unnatural, not even real exercise, those silly carts. Of course, it might just be I can’t solve my slice to save my life. But I love ski towns and when the knee is right or close to right, I still love snowboarding. Well, I might love snowboarding, but for these folks it’s life, bigger than life. Like McKinney himself was bigger than life in the most extreme form of an extreme sport. Remember, the slopes kill around 40 each year in America. There can be consequences. Watch yourself. He proved too wild for the U.S. ski team, though assuredly fast enough. He was the first to break the 120 mph barrier, the first to break the 200 kph barrier, maybe the sound barrier had he lived long enough, had he survived a drunken driver hitting his parked car in 1990. He was the first to hang glide off Everest, and was an elite mountaineer. I like that he cited horseback riding, his mother’s love, as the foundation to it all. Maybe its ethic helped him come back from a big fall and full body cast to break the world speed record — again — the next year. His little sister Tamara, who grew up to become one of America’s top ski racers in her time, knew him as a sage. Turned out this 6-4 vision of a lanky Viking king also was learned and lived life by a code, setting for himself standards well beyond the physical, she told the full house that Thursday night at the Olympic Village Inn’s event center. Larger than life, a sort of Jimi Hendrix rock star of skiing in the 1970s and ’80s. That’s how he’s described. I believe it. Look at that crowd, all sharing this zest, let’s call it. Not just skiing, not just old-time Squaw Valley, not just him, either, though obviously he is well loved to this day. Maybe it’s a philosophy, a way of living, where the mountains and whatever drives this need for speed intersect, where CEOs and plumbers grip each other behind the neck in joyful greeting after too long apart. Like they know something we don’t. 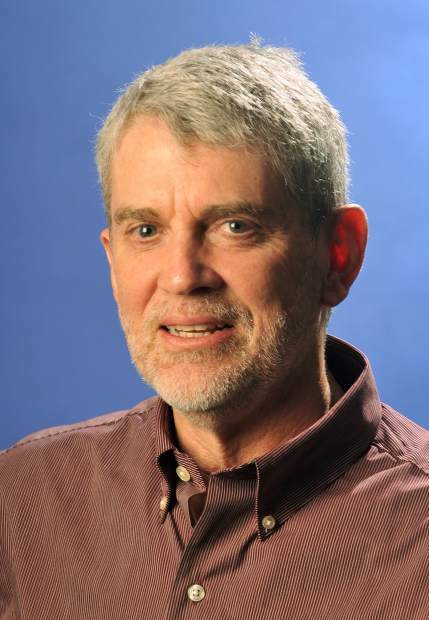 Don Rogers is the publisher of The Union, Lake Wildwood Independent and Truckee Sun. He can be reached at drogers@theunion.com or 530-477-4299.